TapeACall Pro for iPhone is used solely to record all your incoming and outgoing phone calls. With tons of features, the app is rated as one of the best business apps worldwide. TapeACall is a paid app is priced at $10.99 to download from iTunes. TapeACall Pro for iPhone is easy to use and has a simple interface. The design as a whole has one big red button on a dark grey background. After you have recorded the first call, you will find an additional Play button. Tap the play button to view a list of your recorded calls. Tap the Settings icon, you will be able to watch a help video, read phone recording laws in your state, and toggle on or off the recording “Beep” tone that will remind you and your caller that the call is being recorded. The minimum requirement to be functional is that requires a carrier that supports 3-way calling. 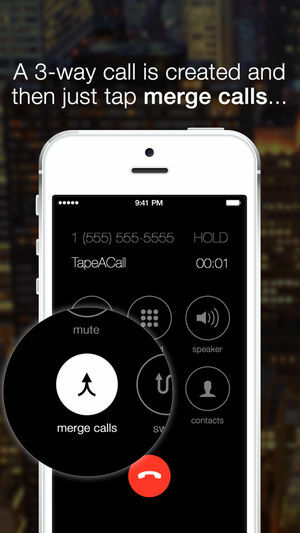 To record an incoming call, open TapeACall and press the record button while you are on a call that you want to record. The app will put your call on hold and dial a recording line. As soon as the line answers, tap the merge button on your screen to create a 3 way call between your other caller and our recording line. To record an outgoing call, just press the record button. The app will dial the recording line and will begin recording as soon as the line answers. Once call gets connected, tap the add call button on your screen and call the person you want to record, then press the merge button when they answer. Once you have recorded the calls, you can easily download recordings to your computer, transfer them to new devices or upload them to Dropbox, Evernote or Google Drive. You can also email recordings in MP3 format and share them over Messaging apps, Facebook and Twitter. TapeACall Pro for iPhone is one of the best recording apps out there. The app requires iOS 11.2 or later. The app has a few in-app purchases as well. Once you pay and install, there is no additional per minute fees. There is absolutely no limit on how long you can record or how many recordings you make.